Former U.S. 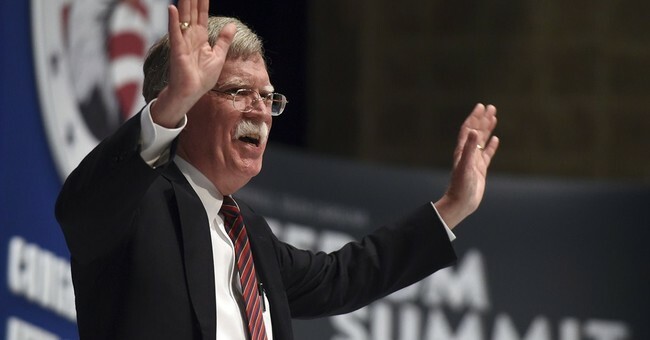 Ambassador to the United Nations John Bolton dropped by The Hugh Hewitt Show, where the diplomat said that between Donald Trump and Hillary Clinton, it’s an easy choice: Donald Trump all the way. He also discussed the lack of evidence to suggest that Clinton will be more hawkish on foreign policy than Obama, adding that she’s “comfortable” with the worldview that has given us a disaster in Syria, Libya, and Iran. Concerning the possible ethics problems the former secretary of state faces from the Clinton Foundation, Bolton said that it just showed how Hillary just ignored every pledge/promise she made upon her confirmation hearing, where she said that no special treatment would be afforded to donors should she be confirmed. Bolton said that exiting and re-entering public life is sort of like a monastery-type mentality. You need to resign or cut connections to every private sector connection you have for the time being. The only acceptable connection to maintain from your former life is your church. Yet, the former ambassador did note that there was a grey area in this regard because regulations didn’t include spouses or children that are also part of the same non-profit, which has been called a slush fund by the non-partisan Sunlight Foundation watchdog. HH: So first question, are you going to vote for Donald Trump or Hillary Clinton? JB: (laughing) That, to me, is an easy choice. I am going to vote for Donald Trump. And I think that’s something that a lot of our friends around the country still need to come to grips with. You know, the Republican field for the nomination had 17 candidates, which means there are supporters out there of 16 disappointed candidates. But compared to the prospect of four years of Hillary and Bill back in the White House, or even worse, eight years, really, I hope everybody just thinks about that a little bit more. HH: Now what do you consider to be the greatest threat of a Hillary Clinton presidency vis-à-vis a Donald Trump presidency? JB: Well, I think that Hillary will be Barack Obama’s third term. I think that’s certainly true on national security. I think it’s true on domestic issues as well. For those who forgot Hillarycare from 1993-1994, people expert in that subject say in fact it was worse than Obamacare. So she has a readymade substitute for the failing, floundering Obamacare system. My personal worry, obviously, is on national security. There’s an urban legend that Hillary will be tougher, more interventionist, more hawkish than Obama. Honestly, other than her own press flaks’ stories over the years, there’s no evidence for that. I think she’s entirely comfortable with the Obama worldview as is John Kerry as is Joe Biden as is the entire leadership of that party. And I think in the dangerous environment we live in internationally now, we’ve already suffered grave harm in the past seven and a half years in a variety of ways to continue it again for four more, eight years, very, very damaging. HH: John Bolton, in the last day, we have learned that S. Daniel Abraham, a major donor of the Democratic Party, wanted a meeting with Hillary Clinton. He went through the Foundation. Bono wanted a satellite link to the Space Station. He went through the Foundation. The Crown Prince of Bahrain wanted a meeting with Hillary Clinton. He went through the Foundation. Casey Wasserman wanted a visa for a crook. He went through the Foundation. And Gilbert Chagoury, a Nigerian billionaire who had to pay the Nigerian government $300 million dollars to avoid being prosecuted for a variety of evil acts, in fact went through the Foundation to connect up with Hillary Clinton’s team at the State Department. What does this record tell you? JB: Well, it tells me that Hillary and her staff, and the Clinton Foundation, violated every pledge, every promise they made during her confirmation process to keep the activities of the Clinton Foundation from slopping over into the government. You know, just so people understand this, obviously not everybody has worked for the federal government, especially in a senior position. I can tell you, having come out of the private sector several times to serve in government, it’s almost like joining a monastery. You have to renounce every private sector connection that you have, certainly anything that has to do with finances, but a lot of other things – charitable organizations. You have to resign from pretty much everything other than your church. But when Hillary was nominated for Secretary of State, they found the regulations didn’t cover this new emerging area where you’ve got your husband, your daughter, your hangers on all involved in a ostensibly charitable or not for profit organization that’s going to continue once she was at the State Department. So hence all these pledges and promises during the confirmation process, which she routinely ignored. I’d like to know where the legal advisor was at the State Department for these four years. Were they just asleep at the switch as they were on the national security threat caused by her emails? Did the whole department just roll over and say the rules don’t apply to them? I mean, it’s just stunning. And again, from the perspective of anybody else that I’ve ever known working in the government, the separation that you go through is one reason a lot of people don’t want to go into the government. They don’t feel they can cut off their business or their charitable works or whatever. It’s too great a split unless you name is Hillary Clinton. HH: Now let me turn to Donald Trump. I have urged him to name his cabinet. I have specifically urged him to name you as his Secretary of State designate. If Donald Trump asked you to serve in that capacity as Secretary of State, would you agree to do so? JB: Well, number one, with respect to your role, I am deeply grateful, and it’s an honor to be considered. You know, you’ve got to talk to somebody about a job like that. It’s not just enough to take a position so you can put it on your resume. You need to be sure, particularly with the State Department, you’ve got an understanding with the president. He runs foreign policy. Let’s be clear about that. But you have to understand exactly what your role would be and so on, and I think that’s a conversation any responsible person would have. But I’ve been honored, privileged, really, to serve in a number of senior positions at State and Justice over the years. And as you know, it’s an honor to serve the country. So obviously, you’d take it very, very seriously. HH: So if he called you up and said Ambassador Bolton, come see me in Trump Tower and let’s talk about the Department of State and you possibly leading it, you would be open to that conversation? JB: I would. I’d just say one thing about your interview with him, which of course, I listened to after I was told about your question, I think what he was saying really was responding when he said he was thinking about it, that what he was responding to your first and broader question about whether a presidential candidate should name some prospective cabinet members before the election. And he had given you an answer where he had laid out the political downsides, which are real, I think, but indicated some interest in still thinking about it. And I think that’s what he was really meaning to say.